An enterprising young Aberdeen entrepreneur is looking to launch a new product with the help of a Kickstarter campaign. Andrew Davidson, from Cove, has designed an alternative to the selfie stick, a tiny, versatile camera mount called PolePod™. 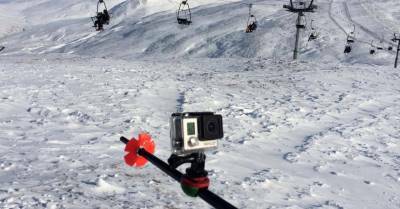 The product is a small sphere which can be fitted to a ski pole, walking pole or even a branch to convert it instantly into a selfie stick. The 24-year-old, who graduated with a Product Design degree from Robert Gordon University (RGU) last year, has set up his own company called AS D-Zine Ltd. He said: “PolePod™ was devised as an alternative to a selfie stick as I wanted to film myself skiing, and didn’t see the point in carrying a flimsy extendable pole when I already had two sturdy ones in my hands. Andrew has had a number of successes since leaving university, being named as one of the winners of the Sports Innovation Challenge at the Sports Business Innovation Awards earlier this year for his first product Go~Iso – a device which can be fitted to an existing water bladder to instantly convert water into a formulated isotonic fluid. He was also selected for the second cohort of Elevator UK’s Accelerator programme which offers participants an intense 12-week entrepreneurial experience to test, research, develop, launch and refine a product or service-led business to become pitch and investor ready, as well as receiving additional support from the Scottish Institute for Enterprise (SIE). Andrew said: “Winning the Sports Innovation Challenge at the Sports Business Innovation Awards was a great achievement and has opened up a lot of opportunities. Andrew will be attending the Eurobike Trade Show in Germany later this month where he is hoping to attract support for Go~Iso. He will also be speaking about his entrepreneurial journey so far at Aberdeen’s TechFest on September 14, before exhibiting PolePod™ at the Telegraph Ski and Snowboard Show at Battersea Park in London in October.